NVIDIA Home > Support Home Page > Knowledgebase Home Page > How do I know if 3DTV Play supports my 3D TV? NVIDIA 3DTV Play supports most HDMI 3D TVs, receivers, projectors, and head mounted display (HMDs) using Release 313 drivers or later. http://www.entechtaiwan.com/util/moninfo.shtm and install the utility. Click File > Save report. You will be saving a .txt file. Please name the file with your name. 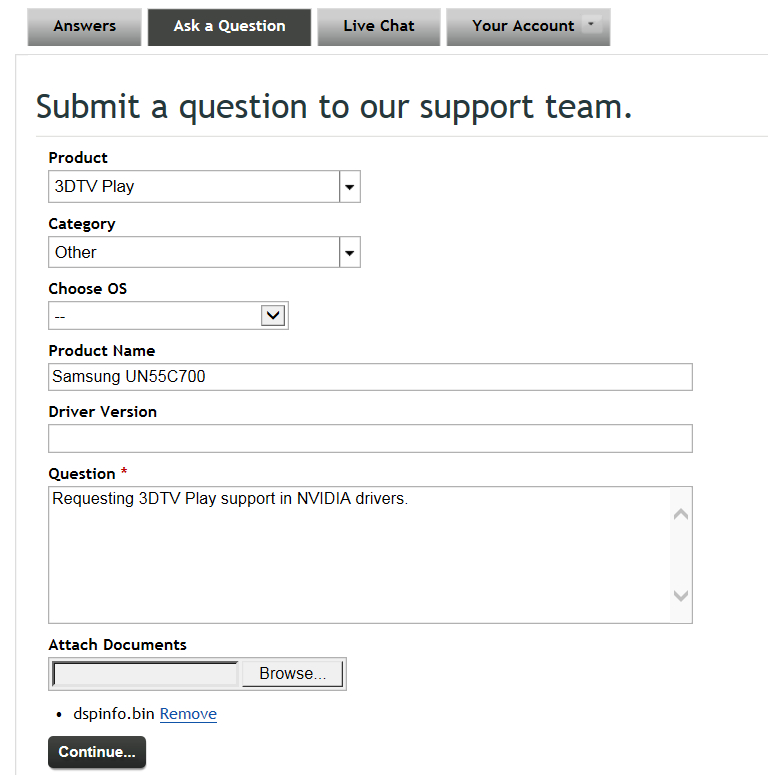 For instance "john_doe_3DTV.txt"
Visit the NVIDIA support site at https://nvidia.custhelp.com/app/answers/list Click the tab "Ask a Question" and fill out the information in the table. Please make sure to include your TV Manufacturer and model number in the Product Name Field and include the .bin in the report under the section called Attach Documents. My 3D projector is not currently supported with 3D Vision. How can I get it working? When I connect my 3D Vision Ready projector to a home theater receiver, I can no longer use my projector in 3D.